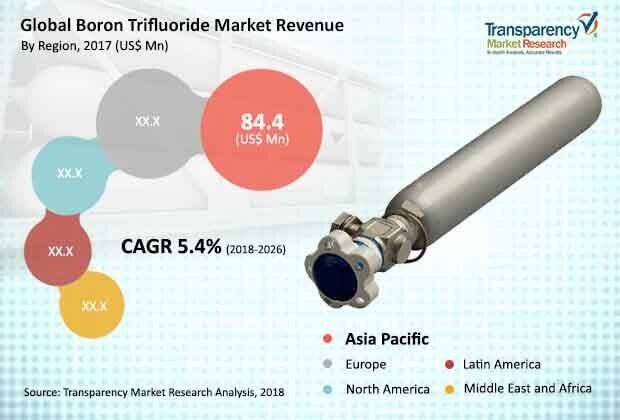 According to a new report published by Transparency Market Research (TMR) titled “Boron Trifluoride Market – Global Industry Analysis, Size, Share, Growth, Trends, and Forecast, 2018–2026”, the global boron trifluoride market is anticipated to expand at a CAGR of more than 5.0% during forecast period. Expansion in the global boron trifluoride market is primarily driven by the rise in usage of BF3 as catalyst and growth in end-use industries. The boron trifluoride market in Asia Pacific is anticipated to expand at a CAGR of more than 5.0% during the forecast period owing to the constant demand for boron trifluoride in various end-use industries across the region, especially in China, Japan, and the ASEAN sub-region. BF3 is one of the strongest Lewis acids available. It is employed as catalyst and reagent in a wide range of end-user industries including chemicals, pharmaceuticals, semiconductors & electronics, agrochemicals, polymers, and plastics. Led by its versatile nature, BF3 forms an integral part of several manufacturing processes in the industries mentioned above. Chemicals, pharmaceuticals, and semiconductors & electronics are some of the major consumers of BF3. These industries are poised to expand at a significant pace in the near future. BF3 is widely used as catalyst for several reactions such as polymerization, alkylation, and isomerization in the chemicals industry. The chemical industry has been expanding at a steady pace. Developing countries in Asia Pacific are expected to be highly lucrative markets for chemicals in the next few years. The semiconductors industry employs BF3 as a p-type doping agent in the manufacture of various semiconductor devices. BF3 is also used in the production of displays of electronic products. Asia Pacific is likely to offer significant growth potential to the semiconductors & electronics industry in the near future. BF3 is employed in the synthesis of various pharmaceuticals in the pharmaceuticals industry. The global pharmaceuticals industry has also been witnessing steady growth since the last few years. In terms of revenue, the global pharmaceuticals industry was valued at more than US$ 990 Bn in 2013 and reached around US$ 1,105 Bn in 2016. The global boron trifluoride market is expected to witness steady growth during the forecast period, owing to the expansion in end-user industries. Based on grade, the boron trifluoride market has been bifurcated into purified and high purity. The purified segment is anticipated to account for major share of the market during the forecast period. Furthermore, the segment is anticipated to create growth opportunities during the forecast period. This can be ascribed to the expansion in the chemical industry. Purified grade BF3 is also employed in other end-use industries such as pharmaceuticals and semiconductors. In terms of application, the global boron trifluoride market has been divided into catalyst, reagent, and others. The catalyst segment is anticipated to dominate the market, as BF3 is a versatile catalyst in the production processes of various chemicals in end-use industries such as chemical, petrochemical, agrochemical, and pharmaceuticals. Furthermore, usage of BF3 as catalyst helps improve the efficiency and yield of the process, and enhance the quality of end-products. It also helps lower production costs. Therefore, it is highly preferred by end-users. In terms of end-use, the boron trifluoride market has been divided into semiconductor manufacturing, chemical manufacturing, pharmaceuticals, and others. The chemical manufacturing segment dominated the global boron trifluoride market in 2017. This trend is estimated to continue during the forecast period. Growth in the chemical industry is projected to drive the boron trifluoride market in the near future. Furthermore, expansion in pharmaceuticals and semiconductor industries is likely to fuel the boron tri fluoride market during the forecast period. Based on region, the global boron trifluoride market has been split into Latin America, North America, Asia Pacific, Europe, and Middle East & Africa. The boron trifluoride market in Asia Pacific is projected to expand at a CAGR of more than 5.0% during the forecast period due to the constant demand for boron trifluoride in various end-use industries across the region. The region offers immense growth opportunities to the boron trifluoride market. China dominates the market in the region due to the expansion in end-user industries, particularly chemical and semiconductor industries, in the country. The chemical industry is the prominent consumer of boron trifluoride in Asia Pacific. Boron trifluoride is a consolidated market; less number of producers operate in the market. Furthermore, these producers are more active at the regional level with localized production facilities. Key players operating in the boron trifluoride market include Honeywell International Inc. BASF SE, Stella Chemifa Corporation, Entegris Inc., and Navin Fluorine International Ltd.